Adoption and giving birth to your own child are different ways of creating a family, one is through your DNA and the other through your heart, both create a family. The love that you feel for your child is pure and real, there is nothing different about it. Add Angelina Jolie quote that there is no difference. Here are a few answers you will feel comfortable saying in front of your children. Go ahead, and vote for the best comeback. 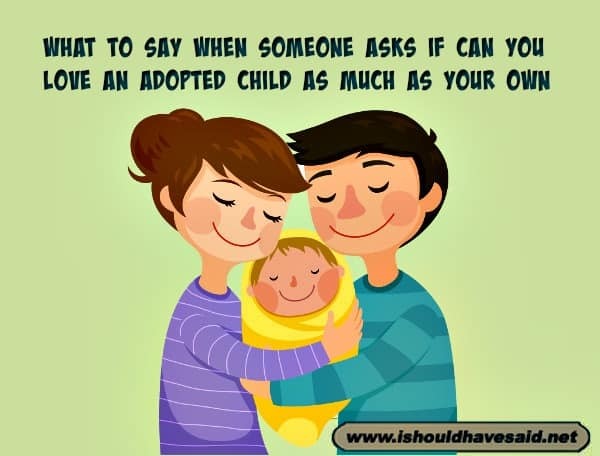 Does it bother you that the adopted child won't be of your own? A family isn't made of blood it's made of love. I gave birth to them through my heart. It's not the soil you're born from or born into, but the water that's consistently and lovingly poured upon you and the sun that shines on you.